3rd Class British Rail Train Ticket – Marple to Manchester London Road – 1956. Courtesy D. Boothman. 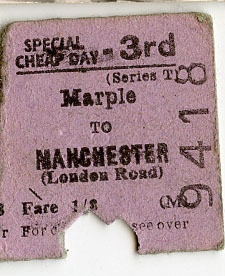 This is a 3rd class single British Rail train ticket from Marple Station to London Road Station in Manchester, dated 9th March 1956. The Marple line to Manchester was opened on 5th August 1862 running on the Manchester, Sheffield and Lincolnshire Railway (M.S.L.) line. Manchester London Road Station opened in 1842, originally named Store Street Station and Bank Top Station. It became London Road Station in 1847 and the named lasted until the station was rebuilt in the 1960s when it was renamed Manchester Piccadilly upon its opening to the general public on the 12th September 1960. In the 1980’s, I worked in a Catholic hostel for homless men at a time when the names of boxers like Spider Kelly; Gallway Blacksmith Peter Kane and a certain Joe-Mac were on the lips of living memory. What few knew outside his immediate circle was that Joe himself, now in his 80’s, was alive and well and living in the backstreets of Ancoats. On this note people would say their goodnights and go their seperate ways until the next gathering. We never heard the end of that sentence, though I am sure it was heard in eternity, for Joe died in the midst of uttering it. 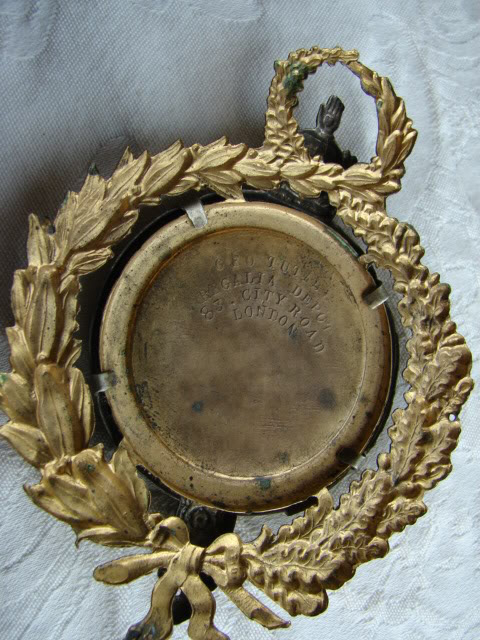 Anyone who knows the history of Manchester knows that the Scuttlers, gangs who terrified our Victorian ancestors, learned to better channel their energy with the advent of Ardwick, Salford, the Adelphi and other Lads Clubs forming a network of concerned activity across the city, bringing years of competitive harmony. In a politically correct era that followed this somehow was forgotten, allowing a rot to set back in that led to needless loss of young Mancunian lives. Our city has again awoken to the need for providing sports and leisure activities on a grand scale. Let’s hope and pray that she doesn’t fall asleep again once the harmony of energetic, friendly rivalry replaces the hopelessness of frightened kids carrying guns and knives. Joe represented the grand old men of a bygone age in a world where, though boxing had changed much, the courage and principles behind the sport remained timeless. The grand older men of today still keep the sport going, with respect passed like a batton from one generation to the next. Again we have boxing clubs being developed by caring Mancunians like Kevin Williams, Bob Rimmer, Ken Dobson and Kaya Dundee. The Mancunian, United Estates of Wythenshawe and other boxing clubs across our city are teaching young men and women courage, skill, respect and confidence. They play a crucial role in keeping them and all of us safe as timeless values are nurtered anew in young Mancunians of all ages and backgrounds. So join me in a toast: TO THE GRAND OLD MEN OF BOXING – IN EVERY GENERATION! LOCHEIM! Following the valiant but unsuccessful struggle that took place to save the great Ancoats Hospital, the local community understood that the remaining Ancoats Dispensary a Grade 11 listed building was to be incorporated into the revitalisation plans for the area. This is however, not the case. 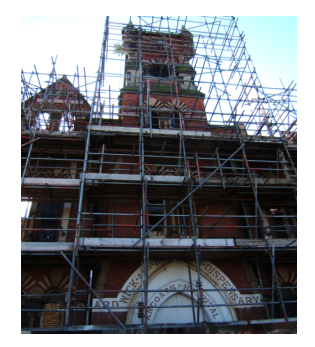 Following the abolition of the North West Development Agency by the current government and therefore along with it the withdrawal of grant funding in the region of £200,000, this historic landmark is faced with demolition. Despite the amazing and creative construction work being carried out by Urban Splash, the Dispensary seems to outlived it’s use and stands as a relic of the past amongst all the new and exciting structures rising up in New Islington and Ancoats Urban Village. “The biggest surprise was the lack of involvement from the local community. Whilst the trust had a few suggestions, none of them were considered workable. We were actually shocked at the lack of local interest and engagement when we asked for ideas of what do with it. I don’t think people don’t care, they just didn’t know what to do with it”. Despite these comments there IS huge interest and passion for saving this building and it would appear that whatever public consultation took place was not effective enough at reaching local residents. There is already an online petition regarding this. We acknowledge that in the present economic climate finance cannot be readily available BUT we believe that the saving of this building is about more than money. It is about preserving the past for future generations and a reminder of the amazing and heroic struggle faced by ordinary yet extraordinary people living in this area.What do the people of Manchester really feel about preserving their Heritage? We are therefore asking the City Council to ensure that a proper public consultation exercise takes place about the future of the Dispensary and to consider supporting the preservation of the building for at least 2 years until all avenues have been explored. If you wish to send any ideas, comments in support of continuing to preserve this great building before it disappears from the landscape altogether then please contact your local Councillors, or email a member of the Ancoats Residents Forum at lindacarver111@btinternet.com .Let’s make the slogan ‘I love Manchester’ really mean something. Thank You. Thank you for your application to add the above building to the List of Buildings of Special Architectural or Historic Interest. If you have the contact details for the owner(s) of the building and have not already provided us with them, I would be grateful if you could contact me. We are now beginning our assessment of the building. Once we have carried out this preliminary assessment we will send you a copy of our consultation report. This report will set out the factual information on which we will base our recommendation. At that stage you will be invited to make any comments you wish to about the building. We will consider all representations made before finalising our assessment and making our recommendation to the Secretary of State for Culture, Olympics, Media and Sport. We will notify you of the Secretary of State’s decision in due course. In the meantime if you have any questions please do not hesitate to contact our Designation Coordinator Rosie Brady on 01904 601951, quoting our reference 469625. Further information can also be found on our website at www.english-heritage.org.uk. 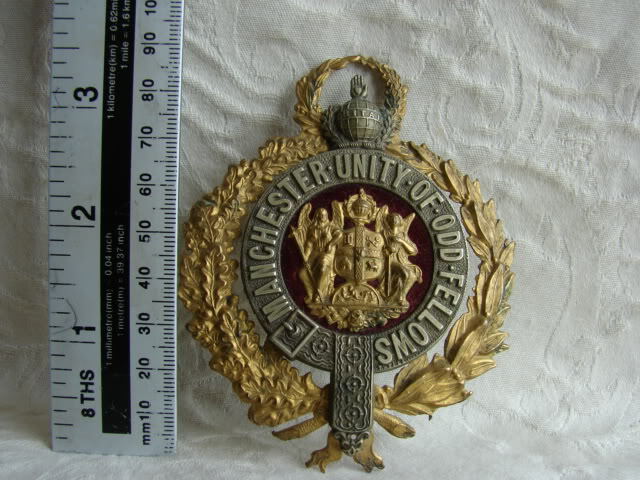 This is an original Manchester Unity of Oddfellows badge made by Yorkshiremen, George Tutill who from his silk banner making factory at 83 City Road, London popularized the standardised design of marching banners and by the latter half of the 19th century was approximately making three quarters of all trade union banners in the United Kingdom. The Manchester Unity of Oddfellows was formed in 1810, having originally been founded in London in the 17th century and is still very much in existence today in Manchester, with their city headquarters on Booth Street.